Your paper and card should be recycled using your blue paper and card recycling box. You no longer need to use the pink sack to recycle paper and card. All paper and card should be placed in the blue paper and card recycling box. Please flatten large boxes and place these next to the blue box. What can I recycle in the Blue Paper and Card Box? Residents who live in communal blocks of flats will have their own arrangements. 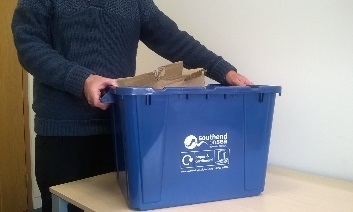 If you have not received your blue box or need a replacement please report it using our online form on MySouthend. To do this please register for MySouthend where you can manage and keep track of your reports and requests online and have control to get the information you need, without having to call of visit us. When you register with MySouthend you will receive updates on the status of your request. Register, or sign in to your MySouthend account. Please present your box at the edge of your property by 7am on your scheduled collection day. Please note that recycling and waste should not be presented earlier than the evening before collection, and should not be placed on the public footpath, grass verge or road or you may be liable to a Fixed Penalty Notice. To find out when your collection day is please see the collection days page. If you have more paper and card than will fit in your blue box (for example after a birthday or special occasion) you can use a cardboard box or paper bags alongside your blue box for the additional recycling. If you produce more than one blue box-worth on a weekly basis then please request additional boxes using our online form on MySouthend. To do this please register for MySouthend where you can manage and keep track of your reports and requests online and have control to get the information you need, without having to call of visit us. When you register with MySouthend you will receive updates on the status of your request. Register, or sign in to your MySouthend account. Please contact us if you require an assisted collection. Why was the separate paper and card recycling service introduced?